‘Amazing!’ ‘Incredible!’ ‘Overwhelming!’ These were some of the words used by our Waterford and Lismore pilgrims to describe the experience of attending World Youth Day in Krakow two weeks ago. Led by Bishop Alphonsus Cullinan and Fr. Shane O’Neill, the group of ten young people from around the diocese joined an estimated 2.1 million young people from all over the world to share and celebrate the joy of their Catholic faith with the Holy Father, Pope Francis, in the historic Polish city of Krakow. Krakow was specially chosen for the event, which takes place every three years, to coincide with the current Jubilee Holy Year of Mercy. Krakow is a spiritual hub of Poland; it was there that the young Karol Wojtyla (the future Pope Saint John Paul II) was ordained a priest, and where he spent many years as archbishop, and where Jesus entrusted the great mission of proclaiming his divine mercy to St. Faustina Kowalska, who lived for many years in Krakow and wrote most of her famous diary there. Being in Krakow for the week of World Youth Day therefore gave the pilgrim the powerful feeling of walking in the footsteps of these great saints. The week consisted of morning sessions of catechesis, music and testimonies with various bishops from the US and Ireland, along with daily Mass. 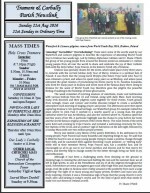 Each morning, many Irish dioceses and their pilgrims came together for these events. Youth groups from Armagh, Down and Connor and Dublin dioceses helped to create a wonderful atmosphere each morning of singing, prayer and praise. The afternoons were then spent exploring Krakow’s rich spiritual heritage; our Waterford group for example visited the place where St. John Paul II worked in a nearby quarry as a young man, the great cathedral where he was Archbishop, and also the convent where St. Faustina spent the last few years of her life. A particular highlight was the chance to pray before her tomb and the world-famous original portrait of the Divine Mercy. The main events of the week were held each evening by Pope Francis, and included a welcoming ceremony for him, the Stations of the Cross, and an outdoor vigil of Adoration on the last night, followed by a Sunday Mass with over two million people present. Mercy was indeed a key theme of the week’s festivities. In his addresses to the young people, Pope Francis had many beautiful and inspiring things to say. He said that it lifted his heart to see so many young people trying to make a positive change through their faith, and he cautioned them against becoming ‘couch potatoes’, or ‘retiring early’ while still in their twenties! Mercy, Pope Francis said, has a youthful face, and he encouraged us all to go out to our home parishes and diocese and be that mercy for others, and thereby help to change society for the better through living our faith in joy and enthusiasm. Although it had been a challenging week, from sleeping on the ground in sleeping bags, to missing the odd meal and battling the rain and the summer heat, we all left in high spirits, in awe at the friendliness and joy of all the pilgrims throughout the week. Everywhere we went, youngsters gave each other high-fives and chanted spiritual songs; even the police in Krakow were visibly amused at the positivity from such a large gathering! The sight of so many young and happy priests, brothers and nuns was also truly inspiring. Overall, it was a tremendous sign of hope that the young Church is very much alive and kicking in today’s world, and it’s the kind of good news that needs to make it to our shores in Ireland as well.